Question: Yo can I use a flowpen for this while using speedflow cocktail ink??? ?answer bak AP! Answer: (AP Reply) i would go for the speed flow. But if you are trying to save money Money Shot will be great too. (AB1 Says:) Yeah just be careful about juicing the nib too much. Too much ink in the nib and your lettering will become ink blotches on the wall. One pump max is all you need. 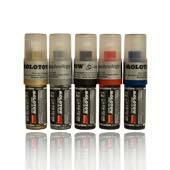 Question: Okay, im working on ordering either an OTR Hard to Buff Pocket marker, or the Molotw Pocket Burner marker. Which one do you think is a better marker? Any suggestions AP? Answer: (AP Reply) Thats a hard one. but for me its a toss up between the cold sweat pocket and the burner pocket. I really like the buttery nature of the cold sweat. But the burner black has that ill chemical black that will bleed through white with a yellowish stain. of course the classic H2b is a smoov criminal as well. hell I really dont know on this one, I like them all. (AC13 Says:) Thanks AP, you helped with the choice. I was wondering about that chemical black. Im pretty sure im going with the Molotov Pocket Burner. Ive been hearing that the Pocket OtR marker streaks..
(apreply) No problem homie. But the cold sweat doesn't streak. Its butter dawg! Question: Yo wher can I grab a T nib for this ap. Please scoop sum up or just go rob bombingscience!!! Answer: (AP Reply) We should have them on one of our marker pallets. We just need to inventory it. (Anonymous Says:) Woorrdd well put up em out for sale and make sum dough!!! And open up sum artprimo shops in jersey foreeeaaalll!! !